Explore the first realistic recreation of the entire USA ever built for a driving game in The Crew® Ultimate Edition, your all-inclusive edition of the revolutionary action-driving game released in 2014. Roam 5000 km² of open world freedom celebrating speed and car culture, get behind the wheel of your dream vehicle and never stop challenging yourself and your friends. 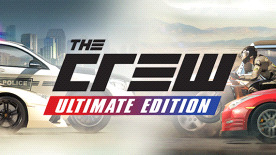 Get the fullest edition for The Crew® universe with more than 120 licensed vehicles of the greatest variety, over 220 tuning specs, a 30-hour story campaign, more than 220 missions, a recurring championship called The Summit bringing fresh events each month, an innovative Cop Vs. Racer gameplay for unprecedented multiplayer fun and unlimited Freedrive activities. Turn on-road encounters into intense rivalries or bond with friends, creating instant challenges with fellow drivers. Jump seamlessly in and out of crews as you travel the open road. Complete 30 hours of story campaign solo or in co-op with friends and seek new rivals to compete against in The Summit, a fresh weekly competition series taking place all over the USA, or prove your driving skills and become either a top cop or the most wanted petrol head in an always-on, all-terrain confrontation. The best open-world driving playground, the whole USA, filled with exciting challenges and surprises. © 2016 Ubisoft Entertainment. All Rights Reserved. The Crew logo, Ubisoft and the Ubisoft logo are trademarks of Ubisoft Entertainment in the U.S. and/or other countries.